Wow! Probably should’ve known that. Who were the famous five then... ? And don’t give us Julian, d*ck, Georgina, Anne and Timmy the Dog. I think they have been a question on here back in the archives. I played for my country at U17 / U18/ U21 and full International. I played 155 times for a club I later managed to some major titles. well that's got to be a record mate, well done Zinedine Zidane is Correct. true. how could I forget that record, especially with the striking resemblance of those two characters to Rossi and Derek. These international breaks drag. Here’s another one. 1. I was born in Manchester in 1943. 2. I had a boyhood friend who became a famous singer and TV star. 3. Most of my clubs were based in the North West, but I spent most of my career at one club in the Midlands. 4. On one afternoon in 1976, I entered into the Football League record books. I even beat George Best into second place that afternoon. 5. I share something in common with a current Derby County player. agree it does drag, plus just when the Town get going as well. anyway this looks a good question, must get the braincells into action before Blueblood or Mr Norris McWhirter Marco get here. 5. I never received a full international cap. It was said that I would have done so if Sir Alf hadn’t preferred his “wingless wonders”. 6. I did, however, represent the Football League versus the Scottish League. 7. The only major trophy I won was in a Wembley Cup Final against my former club. 8. I did win a divisional trophy when I beat an Aberdeen franchise team in the final. Don’t know if SirAlex was manager, but they were called The Whips I think. That franchise American thing was interesting. Quite a lot of clubs had a team out there... Stoke had a team out there... the Stokers. I got the impression that happened in the pre-season ... between end and start of the new season. Probably a bit of a Busmans holiday. Waggy apparently met up with his childhood friend, Davy Jones of the Monkees, when he was out there. Lapping it up in LA in 1967 are (from left) Les Wilson, Dave Wagstaffe, Ernie Hunt, Graham Hawkins, Davy Jones (front) and Bobby Thomson. 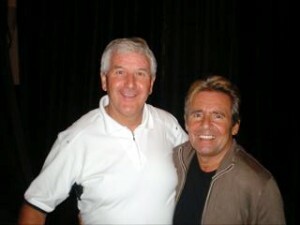 Older and wiser.....Les Wilson (left) and Davy Jones. Wolves won the championship beating the Whips 6–5 after 36 minutes of extra-time. Four goals were scored within a 4-minute period midway through the second half and each team scored during extra time. The game was decided after Whips defender Ally Shewan scored an own goal. Last edited by goldandblack on Thu Oct 18, 2018 8:58 pm, edited 1 time in total. Here’s a photo which amused me. Wagstaffe with his wife and kids. His wife looks like shes an Elvis impersonator or a Coldstream guard. I was born in 1977 in Yorkshire. I played for Leeds United but they was not my first club. I also managed Leeds United at 2 different levels. I was a striker up until I was moved to centre back by an ex Everton player. That sounds a lot like Bam Bam... Richard Naylor? Correct again, well done, always thought he was a class act. we had Lee Naylor at the same time. very similar players. where's all our quiz team gone.